Discussion in 'Beginners' started by Shen, 20 Jul 2007. Not seeing a section on here for tandems, or have I just not spotted it admin? I thought I would start a Tandem thread. It's in beginners as I have the giddy heights of three tandem hours so far. That I suspect makes me a beginner. 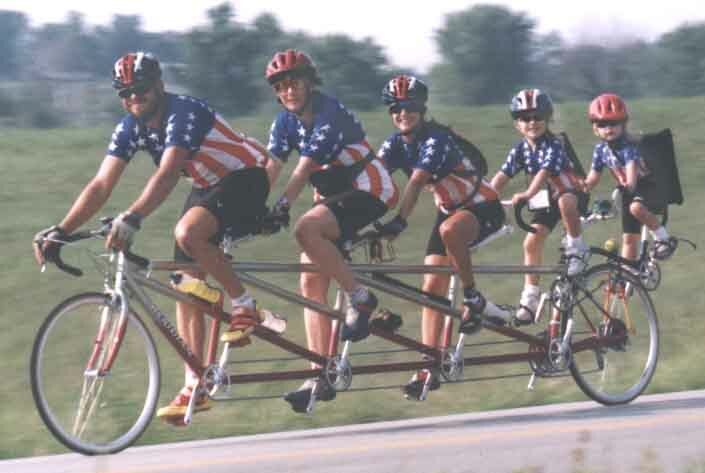 Got a tandem? Got a hint or a tip to ease the way? However, back in the mists of time I used to ride tandem with my brother and one thing I'd say when you're starting out is always tell your stoker when you're changing gear, about to stop pedalling or if there's a pothole coming up. Most importantly, work-out how you're going to start and stop, otherwise one or both of you will lose skin from your shins and you'll hate one another. Then talk to one another - the captain needs to keep communicating with the stoker, who can't see what's coming. I think a tandem's great. Mrs wrx isn't as keen a cyclist as me, so if we go out I keep having to wait and she keeps feeling I'm not waiting. But go out on the tandem and we can ride together, talk to one another. It's like a big powerful but lumbering truck - tons of grunt, fast in a straight line but without sprint accelleration, fairly unmanoevrable. Far faster than a solo on the flat, for a given amount of effort, goes like stink downhill, pretty quick up long shallow drags. Just a bit of an effort on steeper stuff, but that does get a lot better with practice, as you learn to work together in time rather than fight one another - first time you try to honk up a steep hill you'll spend more effort on balancing the thing than climbing, but it gets better. Tandeming is a completely new experience. People smile at you, some to be fair bloody laugh, but they treat you in a quite different way, a better way it seems on short experience. Tandems seem to do something to people, to tickle them is some way. Does anybody know how tall the stoker needs to be.I have a 9 year old daughter who is about 4 foot tall .A tandem could be fun ! Jacob, at the risk of stating the obvious, depends on the frame size. It is not uncommon to see childback tandems on the road, but even if you have a 'standard' small frame, kiddy cranks or crank shortners are available. My boy was 7 when he first went on the back of our tandem. My Dad has a tandem and we took it to France the other weekend, so I have a bit of experience. I do agree that people LOVE tandems, it brings out the best in people, they all say hello or wave. As the stoker though, I found it a bit dull. I couldn't see anything but what was harder was not having control over my gears. Dad's legs are stronger than mine, so he made me use harder gears than I would choose...and I hated that!!! Good link.I think I will try hiring oone first to see how we get along. Where I'm working at the moment is also a holiday resort town and there are many tandems for hire. They seem to be very popular and most nights there are a stream of them going along the sea front!!!!!!!!!!!!!! We hired at Rutland water, cant remember the company name but they were very helpful indeed. Google for tamdem hire. At Hanoi Airport yesterday I saw two European middle aged couples just leaving the airport area on fully loaded Tandems. I couldn't stop to talk to them but they did look good along the road and they certainly were getting plenty of looks from the locals!!!!!!!!!!!!!! And they make such bikes as this five seater based on their own family's cycling experiences. Far from inexpensive, but a passionate and interesting site! I've seen a quadruplet once, which had top and boom tubes like drainpipes, but a quintuplet ! Hey Mr Paul. What does that "cute" on say on the cross bar (ie make?) ?? I can't make it out - even in Photoshop (like that was actually going to increase the resolution!!!! ), but wonder if you know what it actually is? ?